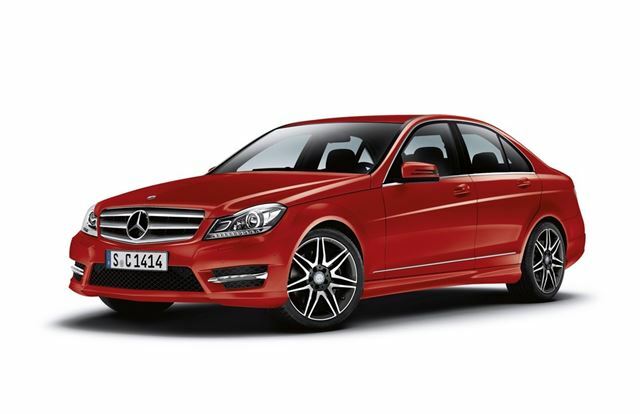 Mercedes-Benz has unveiled an improved C-Class for 2013 with new trim levels, interior tweaks and the introduction of a new engine in the C180 BlueEfficiency. The new petrol engine is actually a 1.6-litre unit but is fitted with a turbocharger to boost power to 154PS along with 250Nm of torque which is now available across a wider rav range from as low down as 1250rpm. In the saloon C-Class it averages a claimed 47.9mpg with CO2 emissions of 138g/km. Meanwhile the 3.5-litre V6 petrol engine has been dropped from the C-Class Saloon and Estate, but is still available in the C-Class Coupe. The C63 AMG models remain unaffected by the revisions. There are new interior and exterior features, including a wider range of colours, repositioned cruise control and indicator stalks and easier-to-read silver graphics for the telematics screen. Trim levels have been changed with the Sport trim replaced by two new variants - AMG Sport and AMG Sport Plus. The AMG Sport Saloon and Estate cost £960 less than the previous Sport models but feature 17-inch AMG wheels and halogen headlights. The AMG Sport Plus, priced £1000 above AMG Sport and just £35 over the previous Sport line, includes 18-inch bi-colour AMG alloys, xenon headlights with Intelligent Light System and Adaptive High Beam Assist, AMG sports seats, Black Artico/Dinamica upholstery with contrast red stitching, red seat belts, AMG floor mats with red edging and silver gearshift paddles on automatic models. In the C-Class Coupe, the pricing and specification of the AMG Sport are unchanged, but an AMG Sport Plus version is now available for an additional £1000. A £530 AMG Handling Package is also available which features uprated steering, engine, exhaust and transmission response, as well as unique styling touches. The Dynamic Handling Package continues to be available on selected Saloon and Estate models. Executive SE is the new entry-level trim and comes with a sports grille, new 16-inch alloy wheels, Artico upholstery and LED daytime running lights at a price increase of only £35 over the previous SE grade. A Luxury Package is available for Executive SE models to replace the former Elegance trim option. Costing £2000, it includes the three louver grille with bonnet-mounted star, 17-inch alloy wheels, a storage package and brown Ash wood trim with a matt finish.